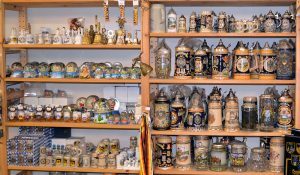 It doesn’t matter whether you’re looking for Düsseldorf city maps and information brochures, colorful greeting cards, collector plates, souvenir spoons and tableware, printed textiles, black forest cuckoo clocks, figural nutcrackers, original beer steins, „Made in Germany“ or other small gift items. 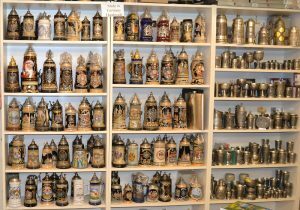 We certainly have a nice souvenir or a wonderful gift item for you and we are looking forward to your visit in our souvenir shop. If you have a special request, please just contact us! We are happy to advise you with our experience. We also offer various printed textiles, and t-shirts, hats, caps, scarves, umbrellas, bags or flags. Something traditional that remind you Germany. 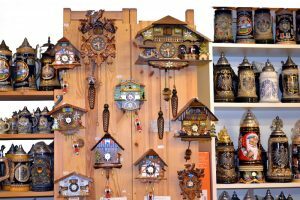 We sell also the classic souvenirs and gifts around the beautiful city of Düsseldorf and from Germany.